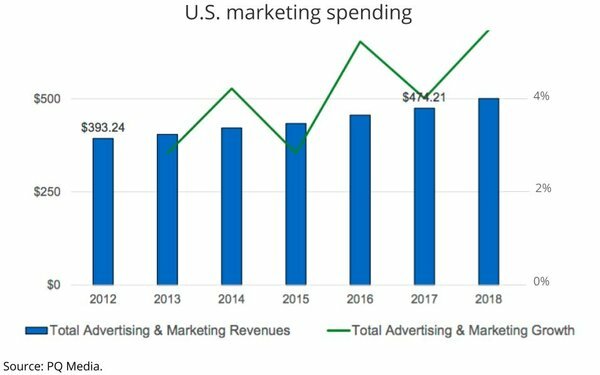 Worldwide marketing spending will approach $1.3 trillion this year, with about two-fifths of that going to the U.S. marketplace, according to an updated forecast released today by media and advertising industry economists PQ Media. 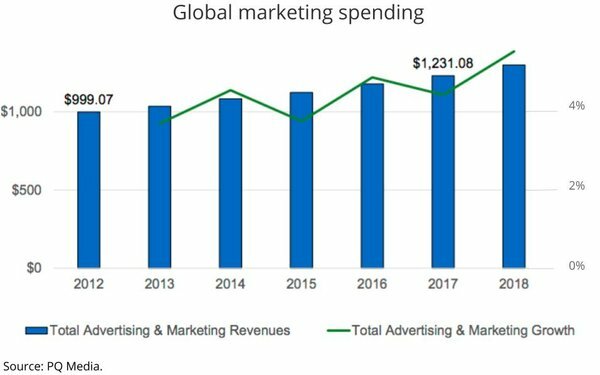 The revised forecast calls for global marketing expenditures -- including advertising -- to expand 5.5% this year to $1.299 trillion in 2018, marking the fastest expansion in 10 years. PQ says it is being fueled by “accelerated growth in traditional media such as television advertising and public relations, and strong growth in digital and alternative media, including smart technology marketing, over-the-top video advertising and influencer marketing. The findings, which come from PQ’s just-released Global Advertising & Marketing Revenue Forecast 2018-22, also project that the U.S. -- the world’s top media marketplace -- will top half a trillion dollars for the first time this year.